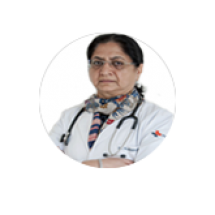 Dr. Kataria has immense experience as a Radiation Oncologist in treating all types of Cancer patients in leading centers in Gurgaon. As a Professor of Medical Oncology, she specializes in pathology field. She is a qualified D.N.B. (Radiotherapy) from National Board of Examinations, New Delhi in 1993, M.B.B.S. from Indira Gandhi Medical College, New Delhi in 1984, M.D. (Radio Therapy) from PGI, Chandigarh in 1987.